Updated 2014/11/21 : Fixed a bug when deploying (thanks @meyer_baptiste). Added a command to update GitHub commit status (thanks @samuelroze). At Les-Tilleuls.coop, we built great e-commerce platforms and high-performance web applications with quality and agility in mind. 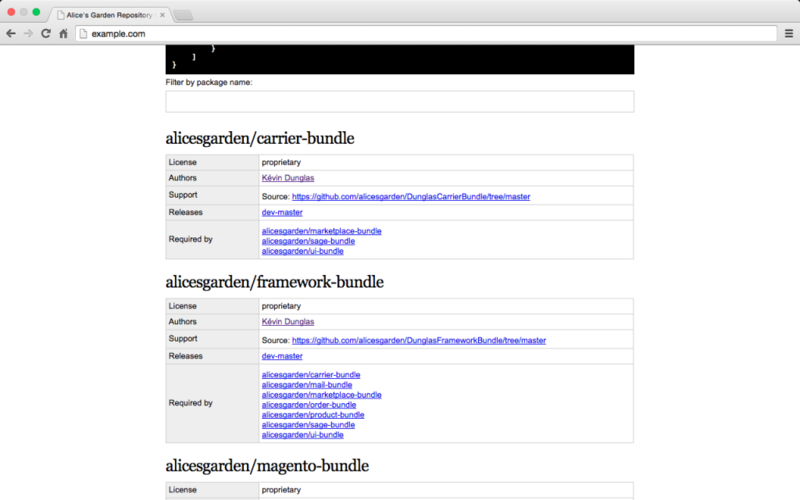 I managed to build a pretty cool CI system allowing us to deliver high quality Symfony applications. In this tutorial, you’ll see how it looks and how to install it step by step. If you aren’t using a CI system, it will increase drastically the quality of your Symfony projects and over the time, it will increase your team your development skills. Finished feature branches are reviewed and merged in the master branch through GitHub Pull Requests by a lead dev only when all tests and checks are green. The following tutorial can be followed on Debian (wheezy) and Ubuntu. If nothing goes wrong, the Jenkins UI is now available on the port 8080 of your CI box. Open the UI in your favorite web browser. So easy. Jenkins is now secured! Go back to security settings to disable the signup form. 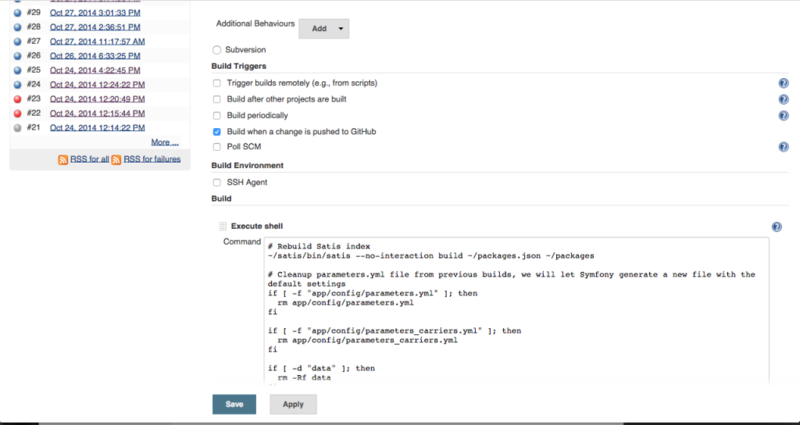 Jenkins must be able to pull data from your privates GitHub repository. The best way I found is to create a GitHub machine user with a read-only access to private repositories. You can add users with write access to your repositories from GitHub by clicking “Settings” then “Collaborators” (the write permission is necessary to update the build status on GitHub. If you don’t care about this feature, just set a read only access to the repo). The last step is adding the public key to the GitHub account of the machine user. From GitHub’s homepage, logged in as your machine user account, go to “Settings” then “SSH Keys”. Add a new key with the content of /var/lib/jenkins/.ssh/id_rsa.pub. Jenkins is now able to connect to our GitHub repositories. To update the GitHub commit status, our machine user will also need an access token to the GitHub API. Go to the settings page of the user, click on “Applications” then click on “Generate new token” and be sure to check the “repo:status” permission. Save the token, we’ll use it our build script. You noticed that I also installed APC to speed up script execution. I’ve also installed SQLite. I use it as DBMS for the test environment of Symfony applications. Satis is the most popular (and the only open source) private Composer package repository. This tool generates a static Composer index. Later, we will add a task in Jenkins to rebuild the repository at each commits. It will allow us to have an always up to date Composer Package Repository. To do that, we must install Satis and make the jenkins user must able to run it. This config file will enable 2 privates Composer packages ( repo1 and repo2 ). Thanks to the SSH keys we configured later, the jenkins user is able to connect to our privates GitHub repositories. Of course those repositories must have a composer.json file at their root. 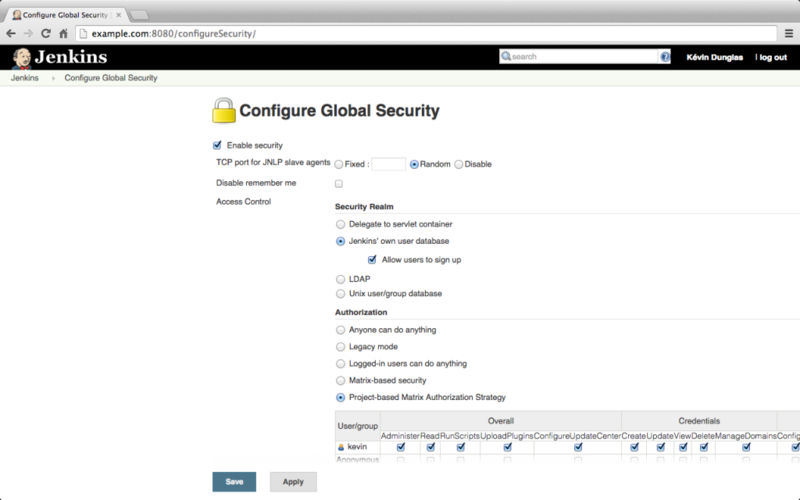 Full configuration options of Satis is documented on the Composer website. Don’t forget to replace <my-ip> by the list of IPs allowed to access the package repository. It will prevent exposing your private repository on the whole internet. We should be able to browse the repository through our favorite web browser. Git and GitHub support are available through plugins. Go to “Manage Jenkins” then “Manage Plugins” and install plugins called “Git Plugin” and “GitHub Plugin”. Their names should be explicit. Then, we will setup a GitHub Webhook to trigger a build every time a commit is pushed, in any branch. Go to your GitHub repository, click on “Settings” then “Webhooks & Services”. 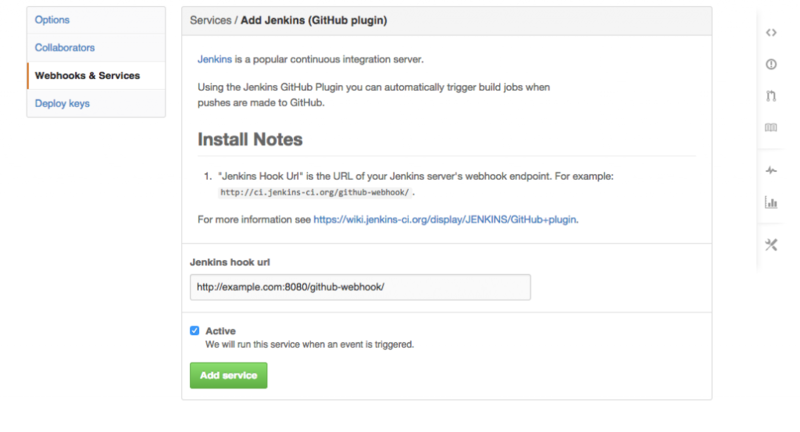 Click on the “Add service” select box and choose “Jenkins (GitHub plugin)”. Enter your Jenkins’ webhook endpoint in the box, it should be something like http://ci.les-tilleuls.coop:8080/github-webhook/ (just replace the domain part of the URL) and click “Add service”. The webook is set! Jenkins will be notified every time we push something our GitHub repo. Repeat this step for every GitHub repository you want to trigger builds. PHP CS Fixer is an awesome tool provided by SensioLabs. It’s 1.0 version has just been released. It automatically fixes PSR-0, PSR-1, PSR-2 and Symfony coding standard violations. With its --dry-run option, it can be used in our CI to check if the produced code is clean. phpDocumentator generates a beautiful HTML documentation based on DocBlocks documenting your classes and methods. We love Behat and Mink. We use them to manage our user stories and to run automated web testing scenarios. Standards Symfony controllers are tested with the Symfony2 extension. But nowadays, we create more and more Single Page Applications usually composed of a Symfony 2 backed JSON / REST API and an AngularJS client. It sounds like a good idea to also test interactions between AngularJS clients and Symfony REST API in the CI system. Behat and Mink will help. I usually use Mink Selenium2 to drive PhantomJS, an awesome headless browser based on Webkit. Unlike the Symfony2 extension, the PhantomJS needs to access the application trough a public URL. We need a front controller exposing the test environment. Lets write it. We will also configure the built-in web server provided by Symfony to avoid configuring a heavier solution like nginx + PHP FPM. The first step is to create a new front controller for the test environment (Symfony comes with front controllers for prod and dev environments but not for test ). default: extensions: Behat\MinkExtension: base_url: "http://127.0.0.1:8000" selenium2: wd_host: "http://127.0.0.1:8787/wd/hub"
You are ready to write scenarios testing the whole app. They will be executed at each commit! To test consistency across browsers and platforms (mobile devices, exotic systems…), you can take a look to SauceLabs. This SaaS platform is well integrated with Behat and can be a good (but more expensive) replacement to PhantomJS! SensioLabs published earlier this year a SaaS platform running quality analysis for PHP and especially Symfony projects. That service is called Insight. It’s user friendly, cool to play with (it provides some gamification with a system of “medals”) and finds a lot of bad practices in bundles and Symfony applications. The first step is to create an account and register your project on the Insight website. Configure your credentials, set the Git repository to analyse and run manually a first analysis. You will probably find some problems in your app that must be fixed! The first time you’ll use insight.phar, you’ll be prompted for your user id and API token. 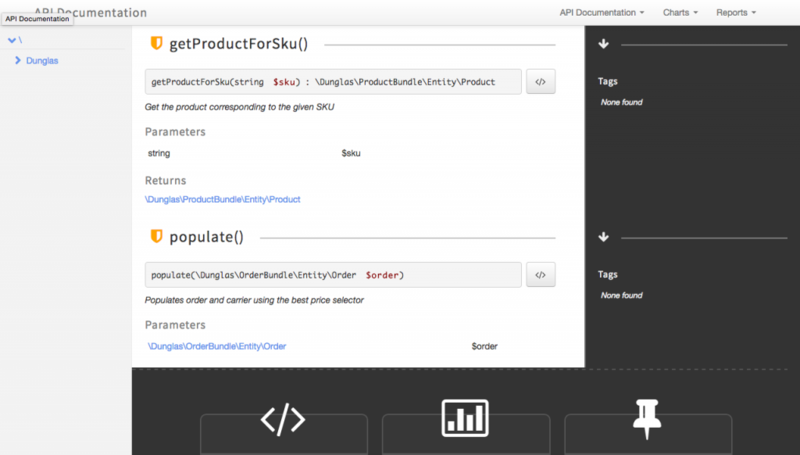 You can find them in your SensioLabs Insight account page (“API/SDK” tab). Your credentials will be saved by insight.phar. 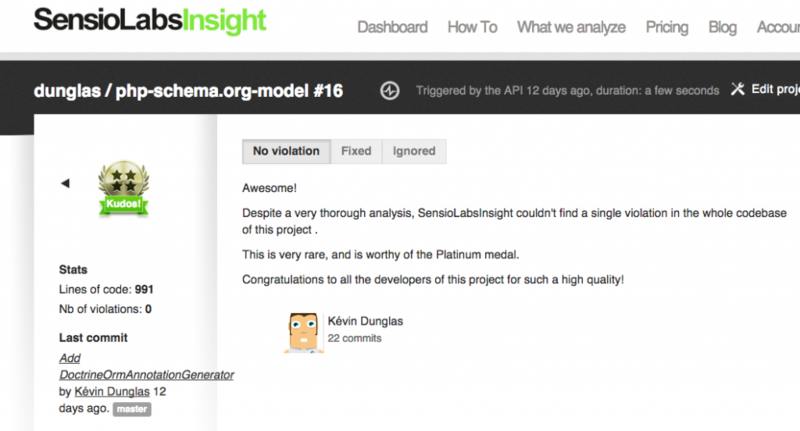 We are now able to integrate SensioLabs Insight in the Jenkins script. Write the uuid of your project somewhere, we will need it later. Insight can output violations in the PMD format. You guessed it, Jenkins has a PMD plugin able to display nicely that sort of output. 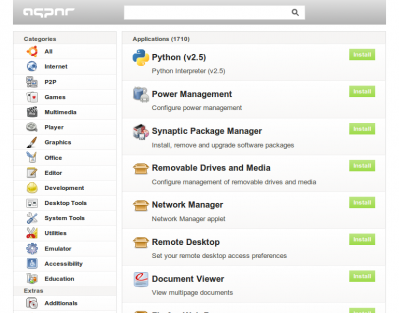 Go to “Manage Jenkins”, “Plugin Manager”, click on the “Available” tabs and search for “PMD plugin”. Install it. SensioLabs Insight is free for public open source projects but a subscription is needed to analyse private projects. I think it’s a good investment but I can’t blame you if you prefer using open source softwares. Sebastian Bergmann (the author of phpunit) maintains a great documentation explaining how to set up open source quality checking tools including PHPMD, phploc, PHP_Depend and phpcpd. Fell free to complete your installation with jenkins-php.org. Note: at the time I write these lines there is some issues with the PMD output and the fail-condition option of the insight command. I’ve submitted fixes to them and I hope they will be integrated soon in the PHAR file. It’s always good to have a testing server running the last version of the project. Sometimes, we go one step beyond and we let Jenkins pushing stable code in production thanks to Git’s tags (not detailed here). Anyway, I use a tool you probably already know: capifony. It’s a deployment software specialized for Symfony projects built on top of Capistrano. It’s the easy way to deploy your application. It handle copying the source code to the server using Git, setting correct directory permissions, installing project’s dependencies, running database migration scripts, restarting services such as PHP FPM and many more. If you don’t already use it, give it a try, you will love it. Go back to the Jenkins Dashboard and click on the “create new jobs” button. On the next screen give a name to your project and choose “Freestyle project”. Basically, the script run the various tools we installed earlier and don’t stop when an error occurs. Instead, it collect the return status of commands, and returns at the end of the script if the build is successful or not. It allows to always run all checks, even if one fail. The deployment (if enabled) only occurs if the build is successful. The built-in web server and PhantomJS run in background to allow them working simultaneously with Behat. They are killed after Behat exited. Don’t fortget to customize value of variables in the top of the script. Why not a XML file? Because I sometimes use other build servers such as Travis CI and Bamboo. Using a simple shell script allows to easily replace Jenkins with another server. Shell scripts can also be versioned directly in the Git repository. Because Composer stocks an OAuth in .composer/auth.json , all next calls to GitHub will succeed, even when launched by Jenkins. Default options should be OK.
To customize mail parameters, from the Jenkins homepage go to “Manage Jenkins” then “Configure System”. SMTP settings are under the “E-mail notification” section and the address used by Jenkins to send mails in “Jenkins Location”. As any software, all tools used by our CI server get updates fixing bugs and adding new features. Debian and Jenkins can be updated using apt. Jenkins plugins updates are managed directly trough the Jenkins user interface. But software we installed locally must be updated “by hand”. We will periodically run a small shell script I’ve written to update those tools. You’re CI system is now ready. Your full test suit and quality analysis are running against new produced code in realtime! We also have quality checking and tests specifics for our frontend apps. Maybe If people are interested about that, maybe I’ll write another post detailing our infrastructure. Petit mémo pour configurer un serveur web LAMP sur un dédié OVH fraichement livré. La distro choisie est Ubuntu 12.10. L’installateur nous demande de rentrer un mot de passe root pour le serveur MySQL (tant mieux) et le serveur web à configurer pour phpMyAdmin. Choisir apache2. Donnons ensuite à dbconfig-common les mots de passe nécessaire pour qu’il configure les bases de données utiles à phpMyAdmin. Notre serveur web est prêt à l’emploi ! Commençons par éditer /etc/apache2/conf.d/security pour rendre Apache plus discret. Passons ServerTokens à Prod et ServerSignature à Off. Au tour de PHP. C’est dans /etc/php5/apache2/php.ini que ça se passe, expose_php doit être à Off. Profitons-en pour régler notre fuseau horraire : date.timezone = Europe/Paris. Ubuntu 12.10 est fournie avec PHP 5.4. Plus besoin de s’occuper de register_globals et des Magic Quotes, ces “fonctionnalités” ont été supprimées upstream. Bon débarras ! Si vous n’utilisez pas d’applications PHP antédiluviennes, passez short_open_tag à Off . Ajoutons /var/lib aux répertoires sauvegardés quand l’installateur nous le propose (ce répertoire contient entre-autre les base de données binaires MySQL). Si vous avez opté pour un dédié OVH vous disposez peut-être d’un espace de sauvegarde FTP gratuit (ce service ne semble malheureusement plus exister sur certaines offres Kimsufi). Pour l’activer rendez-vous dans le manager : section Services puis Backup Ftp. Une fois le mail avec les identifiants reçu éditons /etc/backup-manager.conf pour les indiquer à l’utilitaire. Choisissez le type de configuration “Site internet”. Note : la configuration d’un serveur mail qui envoi des courriers qui ne finissent pas dans “Spam” nécessiterait un article complet. 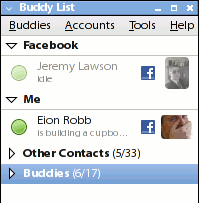 Les anciens utilisateurs de Easy Ubuntu trouveront sûrement un intérêt à l’article intitulé Installation des pilotes et des extensions nécessaires à une utilisation courante publié dans Linux Starter Kit / Linux Identity n°6. Dedans, j’y détail l’installation des composants soumis à des brevets logiciels et / ou non-libres qui ne sont pas distribués avec Ubuntu mais qui se révèlent malheureusement indispensable pour une utilisation multimédia de son ordinateur (lecture de musiques et de vidéos, de DVD, jeux vidéos en 3D, …). L’article revient en partie sur les fonctionnalités du petit utilitaire que j’avais conçu aux débuts d’Ubuntu et indique comment arriver au mêmes résultats en utilisant les mécanismes qui ont étaient intégrés dans la distribution depuis. 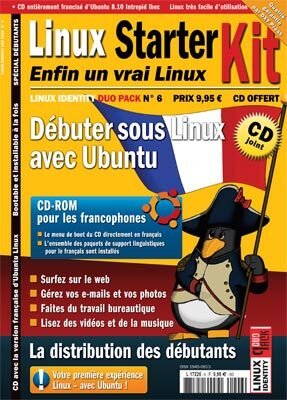 Le magazine est fourni avec un CD d’installation francisé d’Ubuntu Intrepid Ibex et contient bon nombre d’autres articles qui compléteront agréablement la documentation francophone pour vous aider à prendre en main la distribution. Il est disponible en kiosques et depuis le site internet d’Oxy Press pour une dizaine d’euros. Ou plus précisément une partition de type ext2/3, le système de fichier le plus populaire sous GNU/Linux, utilisé par défaut sur Ubuntu. 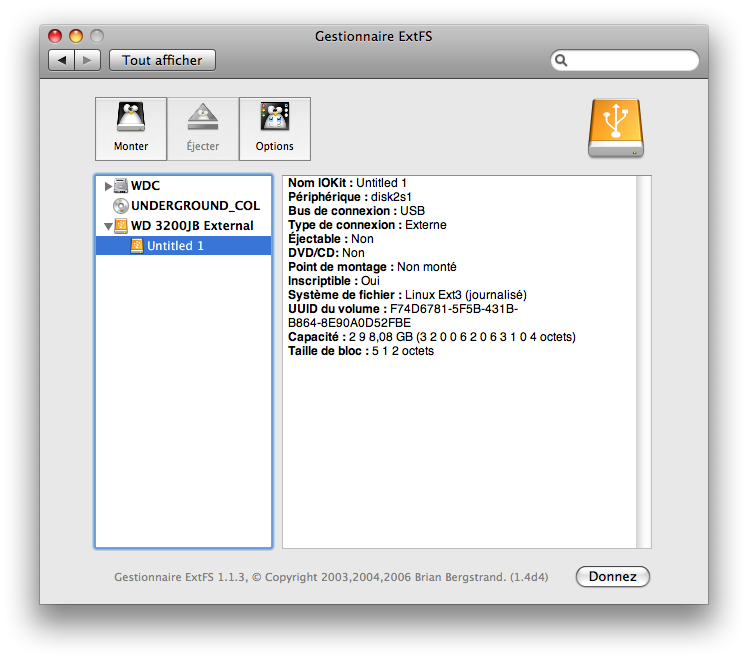 Mac OS X n’inclut pas de pilote pour monter les partitions ext2, heureusement un projet libre comble ce manque : ext2fsx. Récupérer la version ext2fsx_dev sur le site du projet, la seule supportant l’architecture x86 (tous les Mac depuis le passage aux processeurs Intel). Un simple double clic sur le fichier .dmg et un redémarrage de l’ordinateur suffira à l’activation du pilote. Vous pouvez désormais monter vos partitions formatés en ext2, 3 ou 4 via la commande mount ou depuis un sympathique petit utilitaire nommé Gestionnaire ExtFS que l’on trouve dans le menu Autre des Préférences Système. Appnr est un portage web du système d’installation de paquets simplifié d’Ubuntu (GNOME Application Installer). Il permet de parcourir les différents logiciels disponibles dans les dépôt de notre distribution favorite depuis un simple navigateur et via une jolie interface AJAX. Appnr reprend les grandes lignes de son grand frère desktop : classement par catégorie, alphabétique et par popularité. L’application utilise le pseudo-protocole apturl afin de permettre l’installation des paquets directement d’un simple click depuis Firefox. Appnr est très pratique pour suggérer l’installation d’un logiciel à un utilisateur d’Ubuntu via le réseau de manière intuitive et user-friendly. Elle pourra également agréablement remplacer le très austère packages.ubuntu.com pour fouiller dans les dépôts depuis un autre système. Tout comme dans la dernière version de Adium, l’excellent client libre de messagerie instantanée pour Mac, il est possible de se connecter au chat Facebook via Pidgin (anciennement GAIM). Pour ce faire, nous devrons lui greffer un plugin disponible sur Google Code. Voici la marche à suivre pour l’installer sous Ubuntu. Récupérez les archives facebook_icons.zip et pidgin-facebookchat-*.deb (à l’heure ou j’écris ces lignes pidgin-facebookchat-1.37.deb) sur la page du projet dans le bloc Featured Downloads. Installez maintenant le plugin par un simple double-click sur le fichier .deb puis un click sur le bouton Installer le paquet qui se trouve en haut à droite de l’installateur de paquets Gdebi. Relancez Pidgin si il est déjà en cours d’exécution puis ajouter votre compte Facebook depuis le menu Comptes puis Gérer. Il existe également un thème d’émoticones pour Pidgin nommé Original Smileys qui contient tous les smileys officiels de nombreux services dont le Facebook chat. Son installation est simplissime, téléchargez l’archive, déroulez le menu Outils puis sélectionnez Préférences. Rendez-vous dans l’onglet Thèmes des frimousses, cliquez sur Ajouter et sélectionez l’archive téléchargée. Gandi m’a gentiment fourni une invitation à la bêta de leur service d’hébergement. Je compte y passer ce blog et voir comment se comportent les frameworks Symfony et Django sur ces serveurs virtualisés et scalable. J’ai donc pris une part (6€ HT/mois) afin d’y installer un serveur web composé d’Apache, de PHP, de MySQL et géré par hosting.py. Première opération, créer le serveur. J’ai choisi le mode expert et Ubuntu comme distribution (c’est le choix par défaut). Tout ce fait très simplement via le site internet de Gandi. Quelques minutes après la création du serveur via l’interface un mail arrive vous indiquant l’adresse IP de votre serveur tout neuf. C’est une version personnalisée par Gandi de Gutsy qui est installée, un peu vieille mais très stable, cela me convient parfaitement. Première opération : mettre à jour la distribution. Connectez vous via SSH puis passez en root en tapant su (un peu perturbant pour une Ubuntu n’est-ce pas :P) puis tapez la classique commande apt-get update && apt-get dist-upgrade. Cette mise à jour est importante car elle corrige certaines failles de sécurité critiques dont celle désormais célèbre touchant le protocole DNS. La commande magique pour installer le tout : apt-get install apache2 mysql-server php5 libapache2-mod-php5 php5-mysql phpmyadmin. L’utilitaire d’installation vous demandera d’abord de choisir un mot de passe pour le compte root du serveur MySQL puis de sélectionner quel version d’Apache doit être configurée pour être utiliser avec phpMyAdmin : choisissez apache2. Vous pouvez taper l’adresse IP de votre serveur dans votre navigateur préféré afin de vérifier que tout fonctionne bien. phpMyAdmin est accessible depuis http://<votre_ip>/phpmyadmin/. Une petite amélioration afin d’augmenter les performances : installons xcache. Comme son nom l’indique, xcache permet de mettre en cache les versions “compilées” des scripts PHP (opcode) et ainsi d’améliorer grandement les performances du langage le plus populaire du web. Rien de plus facile : apt-get install php5-xcache. La commande /etc/init.d/apache2 restart vous permettra de rendre effective la mise en cache. Les en-têtes HTTP sont riches, trop riches : on y apprend que le serveur fonctionne sous la distribution Ubuntu Linux, que le serveur web est Apache en version 2.2.4, que le langage de script PHP en version 5.2.3 est disponible et que les versions installées sont celles pacagées par la distribution (ce qui donne des indices supplémentaires sur la configuration utilisée). Ces informations sont en partie reprises dans les pages d’erreurs et les index générés automatiquement du serveur web. Même si cacher les noms et numéros de versions des logiciels installés n’améliore pas la sécurité réelle de votre serveur elle le rend moins visible des pirates en herbe et autres robots des amateurs de warez. Pour masquer les informations distillées par Apache éditons le fichier /etc/apache2/apache2.conf, remplaçons la ligne ServerTokens Full par ServerTokens Prod puis ServerSignature On par ServerSignature Off. Pour celles que fourni PHP c’est dans /etc/php5/apache2/php.ini que ça se passe. Remplacez expose_php = On par expose_php = Off. Même si cela n’a rien à voir avec les numéros de versions, ça peut être une bonne idée de désactiver églament les magic quotes en remplaçant magic_quotes_gpc = On par magic_quotes_gpc = Off. Relançons encore une fois Apache /etc/init.d/apache2 restart afin de faire prendre en compte nos modifications, c’est mieux. Reste MySQL. Nous avons défini un mot de passe pour le compte root lors de l’installation mais il reste quelques brèches importantes comme la possibilité de se connecter sans compte ou celle d’utiliser le compte root depuis l’extérieur (sans passer par une console SSH ou phpMyAdmin – ce qui facilite les attaques par force brute). Un script fourni nommé mysql_secure_installation permet de remédier à tous ces problèmes. Lancez-le. Excepté pour le changement de mot de passe root que nous venons de définir lors de l’installation je vous conseil de répondre par le choix proposé par défaut à toutes les questions. Notre serveur est un peu mieux préparé à survivre dans la jungle qu’est le web. Note : nous n’abordons ici que la sécurisation des composants LAMP de notre serveur. C’est un bon début mais c’est loin d’être une protection absolue ou suffisante. hosting.py est un petit logiciel que j’ai développé qui permet de gérer de manière très simple des comptes web. Il se base sur le système de gestion des utilisateurs UNIX et automatise les tâches les plus courantes lors de l’administration d’un petit serveur web mutualisé à savoir la mise en place et la modification de compte comprenant un utilisateur UNIX (accès SSH, FTP, …), un hôte virtuel apache, un compte et une base de données MySQL. Il est conçu pour fonctionner avec les distributions basées sur Debian, Ubuntu en particulier. Il permet de simplement séparer les comptes des différents sites qu’hébergera votre serveur, ce qui n’est pas un mal question sécurité. Comme son nom l’indique, logs accueillera les logs de connexion d’Apache (on pourra plus tard configurer AWstats pour générer des statistiques) et public_html sera le répertoire web de nos utilisateurs. Éditez la variable MYSQL_PASSWD du fichier debian-hosting/hosting.py pour qu’elle contienne le mot de passe MySQL de l’utilisateur root puis donnez les droits en exécution sur ce même fichier en tapant chmod a+x debian-hosting/hosting.py. Un sous domaine du type monsite.com.dunglas.fr est automatiquement créé (pour être effectif, il nécessite que dunglas.fr, notre domaine de test, dispose d’un wildcard dans ses entrées DNS). Je vous conseil de le laisser à des fins de test et de debug, néanmoins un vrai nom de domaine c’est mieux. Toujours en tant que root éditez le fichier généré automatiquement nommé /etc/apache2/sites-available/monsite.com et transformez la ligne ServerName monsite.com.dunglas.fr en ServerAlias monsite.com.dunglas.fr. Ajoutez au dessus de celle-ci ServerName monsite.com. Peut-être avez-vous remarqué que l’envoi de mail en PHP ne fonctionne pas après une installation standard de Debian ou de Ubuntu. Pourtant, Debian fournie le serveur de mail exim qui fait partie de la base du système. Tapez connecté en tant que root dpkg-reconfigure exim4-config (sudo dpkg-reconfigure exim4-config sous Ubuntu). Vous pouvez sélectionner les paramètres par défaut proposé pour les autres options. Cela suffira pour activer l’envoi de mail avec PHP sans se soucier de la configuration complète d’un MTA. Les emails envoyés avec la fonction mail() arriveront même sur les boîtes Hotmail (qui nécessite une configuration particulière du serveur) car notre serveur local transmettra juste la demande d’envoi au serveur de notre FAI. Si vous souhaitez installer un véritable serveur de mail sur votre serveur je vous conseil de jetter un oeil à Postfix. hosting.py, c’est un petit script d’administration de serveurs Debian et ses dérivés (testé sous lenny et Ubuntu). C’est un outils très simple destiné à gérer les utlisateurs d’un serveur Web (Linux Apache PHP MySQL). Il permet la création, la modification et la suppression d’utilisateurs UNIX et d’hôtes virtuels Apache. Le support des comptes MySQL n’est pas encore publié, mais il le sera bientôt ! La philosophie derrière ce petit programme écrit en Python est d’utiliser au maximum le compte UNIX plutôt que des utilisateurs virtuels pour chaque services. Configurez vos serveurs FTP, Mail et compagnie pour utiliser l’authentification UNIX. Petit bonus, la gestion des utilisateurs pour le webmail RoundCube est fournie dans les commentaires. hosting.py fonctionne en root (sudo ./hosting.py sur Ubuntu). Après avoir été séquestrés pas mal de temp dans ma cave numérique, mes projet peuvent à nouveau regagner l’air libre ! Retrouvez certains de mes projets sous licence libre en téléchargement ! On y trouve essentiellement des logiciels pour le web et pour Ubuntu Linux, jettez-y un oeil.